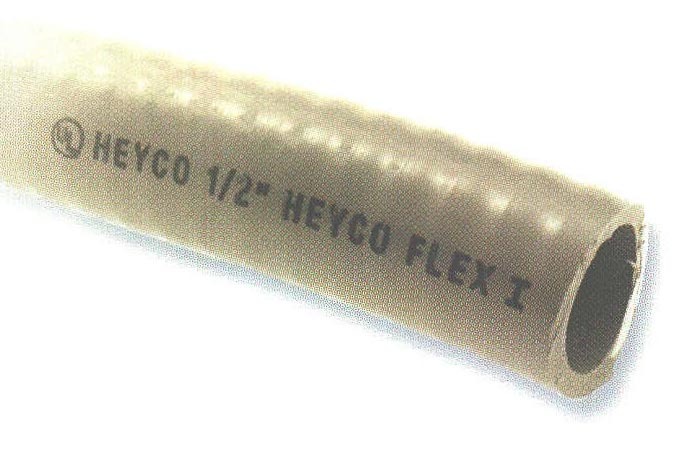 Heyco-Flex I - Liquid Tight Conduit - Bolt Products Inc.
3/8 thru 2" trade sizes. Use with nylon Heyco-Flex Connectors; Snap-in, Straight or Sweep. See pages 0-18, 0-19, 1-20. May also be used with Heyco’s Die Cast Fittings for Liquid Tight Conduit. See page 0-23 or 0-24. Resists corrosion, abrasion, oil, water, acid, metal shavings, and rough environments. Resists abuse, pull, and crushing. Smooth inside for easier wire pulling; no hazardous sharp edges or burrs; will not damage conductors. Quick installation; cuts with utility knife, PVC cutter or Heyco cutting tool (#8340). - Approved for direct burial. Order Part No. 8340, VF-28 Cutting Tool, for cutting Heyco-Flex conduit and tubing cleanly and evenly.